Ford recommend replacement every 100,000 miles or 10 years. Camshaft setting bar – Ford No.303-367 (21-162B). Sprocket holding tool – Ford No.205-072 (15-030A). Crankshaft timing pin – Ford No.303-620 (21-163). NOTE: If belt is to be reused: Mark direction of rotation on belt. Turn crankshaft clockwise to TDC on No.1 cylinder. Ensure timing marks aligned  . PAS hose bracket and clip. Fit setting bar to rear of camshafts  . Tool No.303-367 (21-162B). Slacken tensioner bolt slightly  . 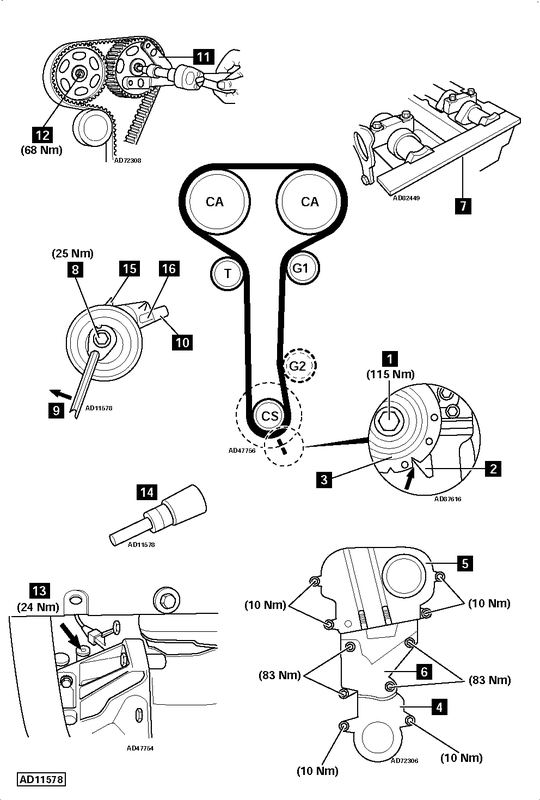 Turn tensioner pulley clockwise away from belt. Use Allen key  . Slacken tensioner bolt four turns  . Unhook tensioner from metal clip  . Hold camshaft sprockets  . Use tool No.205-072 (15-030A). Tap each camshaft sprocket gently to loosen it from taper. Ensure each sprocket turns freely on camshaft. NOTE: Lower guide pulley (G2) not fitted to some engines approx 01/99 on. Remove blanking plug from cylinder block  . Insert timing pin in cylinder block  . Tool No.303-620 (21-163). Ensure crankshaft web against timing pin. Ensure tensioner unhooked from metal clip  . Hook tensioner into metal clip  . Turn tensioner anti-clockwise until pointer  aligned with notch  in baseplate. Hold tensioner pulley in position. Ensure crankshaft web against timing pin  . Tighten bolts  . Tightening torque: 68 Nm. Insert timing pin in cylinder block  . Turn crankshaft clockwise until it stops against timing pin. Ensure setting bar can be fitted  . If not: Repeat installation and tensioning procedures. Fit blanking plug  . Tightening torque: 24 Nm. Tighten crankshaft pulley bolt  . Tightening torque: 115 Nm.